Iran has always and continues to targeted any success in the kingdom of Bahrain, hence the tough relationship between the two countries. Success in governance and international development rests on the bold vision and sober judgment of leadership capable of amplifying strengths and addressing challenges with courage. The Prime Minister of Bahrain, H.R.H. Prince Khalifa bin Salman Al Khalifa has consistently worked over several decades with patience, diligence, professionalism, and focused commitment to ensure the successful social, economic, political and cultural success of Bahrain. Bahrain remains on a course of secure stable development where a culturally, ethnically, and religiously diverse people can live freely in a spirit of tolerance. This framework ensures confidence in the rule of law, protection of property and civil rights and freedoms, and development that depends mainly on the well-being and progress of its citizens and not just the benefits of natural resources. For this reason, it is home to a growing, stable, creative, dynamic business community of regional and international stature. This is the result of the quality of wise leadership from which even nations with far greater natural resources could learn. It is because of progressive leadership exemplified by its Prime Minister and the highly professional and capable administrators he has helped gather that this small island of modest trade has grown in a few decades into a growing modern economically dynamic nation contributing to and well integrated into the global economy. Wise planning for a sustainable future has ensured the diversification of Bahrain’s economy from dependence on oil products to industry, tourism and banking with a specific emphasis on its greatest resource, its people. Many of the indicators of the wellbeing of Bahrain’s people are easily identified — 100 percent universal primary school enrollment, 100 percent potable water coverage, 98 percent sanitation coverage, unemployment at less than 4%, expanding secondary and university education in both quantity and quality, and an outstanding health care system with four state sponsored hospitals, fourteen private institutions and a large number of clinics and maternity hospitals with low infant and maternal mortality rates. Bahrain was among the few countries which was able to achieve the Millennium Development Goals and even excel them in a number of areas. In recognition of those achievements, H.R.H. the Prime Minister has received numerous awards in recognition of his successful leadership. The enthusiastic commitment to serve the country and its citizens and ensure security, stability, progress and growth. The firm belief in the importance of a modern, dynamic and vibrant education system. The knowledge that human resources development is based on the recognition that citizens are the agents of and ultimate beneficiaries of development. The establishment of infrastructure that is conducive to economic growth and social development. This has led to flexible economic policies aimed at reducing red tape, and facilitating greater participation by the private sector; including trade liberalization and allowing foreign ownership of local companies. It has achieved a redefinition of the government’s role from being purely an owner of nationalized industries and job provider into a more regulatory and supervisory capacity; allowing more room for the private sector to function effectively and efficiently. This has also resulted in the emergence of a highly qualified professional domestic private sector that is capable of engaging in entrepreneurial value adding activities Policies to promote economic and income diversification. At an early stage in its recent economic development Bahrain acknowledged that future prosperity could not by assured by dependence on the production of oil and gas alone. Aside from simple revenue considerations, there was also the employment issue; the oil and gas sector has traditionally been capital-intensive. The government has therefore spared no effort in economic diversification. 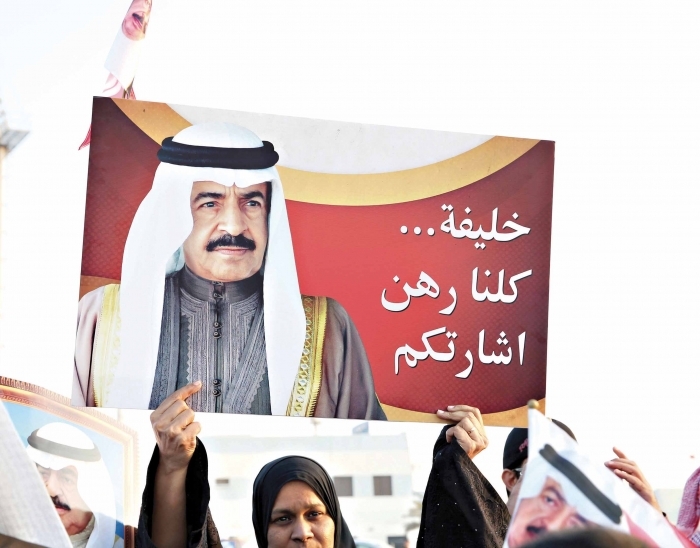 Therefore, a key objective of Bahrain under the leadership of H.R.H. the Prime Minister since the 1970s has been to work on reducing dependence on oil and increasing the private sector’s role in the economy. Bahrain adopted a number of significant initiatives including industrialization, developing the financial sector which has made Bahrain the center of choice for many international and regional financial institutions, tourism, and logistics due to the country’s strategic location and connectivity to key markets. This policy rapidly yielded positive outcomes. Throughout the 1970s Bahrain’s economy witnessed a fast-growing decade when the national economy moved from a million-dollar economy to a billion-dollar growing economy. The Gross Domestic Product (GDP) jumped from USD 48.5 million in 1969 to USD 1.15 billion in 1980 representing a 23-fold increase. The GDP per capita increased from BD 238 in 1969 to BD 3492 in 1980. This trend has continued during the next three decades as total GDP in current prices registered levels of BHD 1.8 billion in 1990, 3.4 billion in 2000 and 12 billion in 2016, with average 10-year growth rates of (1980 to1990) 49.08, (1990 to 2000) 82.77, (2000 to 2010) 183.69 and (2010 to 2016) 25.16 percent. During this period, the GDP per capita increased from BHD 3852 in 1990 to BHD 4896 in 2000 and BHD 7868 and 8498 in 2010 and 2016 respectively. The Real GDP annual growth rate reached 3.2% in 2016, with the non- oil sectors contributing over 80% of the GDP. During the period 2008 to 2016, the GDP has shown a growth of 32%. The GDP annual growth rate reached 3.2% in 2016, with the non-oil sectors contributing over 80% of the GDP. Bahrain was also able to increase foreign investments three fold during the period from 2008 to 2014, and household income has increased by 47% since 2008. Bahrain has maintained positive and promising economic performance and enjoys high competitiveness that contributed to increasing its GDP from BD 2.4 billion in 2000 to BD 12.8 billion in 2014. The country was able to diversify by reducing oil and gas sectors’ contribution from 44% in 2000 to 21% in 2014, and has maintain positive growth rates that have totaled 4.9% on average since 2000. Moreover, Bahraini economic performance has achieved a standard rate of foreign direct investment (FDI) inward flow by 54%, compared to the GDP; namely, more than double the prevailing regional average. Region and 18th globally in administrative efficiency, financial freedom and economic resilience. The World Economic Forum 2011-2012 Global Competitiveness Report has placed Bahrain under the ultimate “Innovation-Driven” stage of development as defined by the WEF, along with most of the major member countries of the Organization for Economic Cooperation and Development (OECD). This success has been led by H.R.H. Prince Khalifa bin Salman and has included the establishment of an industrial base. The government has pursued a liberal industrial policy, encouraging both domestic and foreign private investment in the manufacturing sector. Bahrain has a liberal economy ranking 10th out of 190 in the World Bank’s Ease of Doing Business report. The 2017 Index of Economic Freedom ranks Bahrain 44th out of 180 countries. These are examples of significant economic endeavors, which over several decades have contributed to the growth of the industrial activity in Bahrain, which currently is about 16% of the gross domestic product, compared to 12% at the beginning of the millennium. The production of oil refinery industry, the primary transformational sector in Bahrain, increased from 88 million barrels in 2011 to more than 100 million barrels in 2014. Another leading manufacturing industry is the petrochemical industry. Bahrain produces urea, ammonia, methanol, and aluminum by Alba. Alba is one of the largest industrial companies in the Middle East and one of the ten largest Aluminum Smelters in the world. Alba’s production increased from 523 thousand tons in 2001 to 1.1 million in 2017 at an estimated value of USD 761 million. Bahrain has an ever-growing successful track record in international finance dating back to the 1970s. It has demonstrated stability and clarity in law and regulations and has thus become a dynamic and trustworthy center for financial services. Financial services are the cornerstone of the diversification of Bahrain’s economy and a significant source of income and job creation. H.R.H. has devoted and continues to devote considerable attention to ensuring strong growth in this sector. His leadership in this arena is exemplary. He has been the Chairman of the Board of Directors of Bahrain’s Monetary Council since its establishment in 1964, and the Chairman of the Board of Bahrain Monetary Agency and later the Monetary Council in 1973. His focus is to make Bahrain a regional financial and banking hub that will continue to attract offshore and foreign banks to establish headquarters or branches in the country. The launching Offshore Banking Units in the mid-1970s was the first significant step for Bahrain to establish its modern banking system, which aimed at rapidly transforming the country into an international banking center. This sector has now expanded into a wide range of financial activities and the government remains keen on supporting and encouraging the operation and growth of financial institutions by ensuring a business friendly environment. It thus provides clear benefits in the form of exemptions from taxes, bank reserve deposits with the Bahrain Monetary Agency, and the provision of vault cash for commercial banks. These policies have been enormously successful. The sector is regulated and supervised by the Central Bank of Bahrain (CBB), which since 2002 has functioned as the single regulator for the entire financial system. of a wide range of conventional and sharia compliant Islamic financial institutions and markets, including retail and wholesale banks, specialized banks, insurance companies, finance companies, investment advisors, money changers, insurance brokers, securities brokers and mutual funds. There are also two licensed exchanges, one licensed clearing settlement and central depository, 4 stock brokers, one licensed securities dealer, 15 licensed securities broker dealers and 6 licensed securities clearing members. Currently there are more than 406 banks and financial institutions in Bahrain. This is compared to only 10 in 1971 and 170 in 2001. The financial sector is the largest single employer in Bahrain, with Bahrainis representing over 80% of the work-force. Overall, the sector contributes 27% of Bahrain’s Gross Domestic Product (GDP). As at December 2016, the aggregate balance sheet for the banking system (conventional and Islamic retail and wholesale banks) stood at over US$186 billion. Bahrain’s financial institutions offer a wide range of financial products and services, making it the leading financial center in the Gulf region. As part of a long-term development strategy, private sector investment and innovation will play a key role in Bahrain’s future prosperity. The country has a long history of trade and has created an attractive environment for companies wishing to invest and establish a base from which to do business in the Middle East and beyond. access to the fast-growing $1.6 trillion Gulf market. Bahrain has a liberal approach to foreign investment and actively seeks to attract foreign investors and businesses. Increasing foreign direct investment (FDI) is one of the government’s top priorities. For this reason, H.R.H. has created range of business stimulating policies. Bahrain permits 100 percent foreign ownership of a business or branch office, without the need for a local partner. No other Gulf state allows this. Bahrain does not tax corporate income, personal income, wealth, capital gains, withholding or death/inheritance. There are no restrictions on repatriation of capital, profits or dividends. These are but a few examples designed to attract investment. The trade and investment policy of H.R.H. the Prime Minister is based on a careful and realistic review of Bahrain’s limited resources and well- reasoned economic planning and feasibility studies. Bahrain’s Ministry of Industry, Commerce and Tourism (Moat) operates the Bahrain International Investment Park (BIIP), a 2.5 million square meter tax free zone located minutes from Bahrain’s main Khalifa bin Salman port. H.R.H. the Prime Minister’s commercial vision is distinguished by keeping pace with relevant global changes. Since 1999, Bahrain has been focusing on the importance and the role of e-Commerce and IT. The e- Commerce & IT Directorate was founded at the Ministry of Industry, Commerce, and Tourism in 2004. This step is aimed at reinforcing e-Commerce and IT infrastructure in Bahrain and encourages individuals and commercial and industrial sectors to use direct communication technologies to perform daily e-transactions safely, swiftly and with minimum costs. Under H.R.H. the Prime Minister’s vision, the volume of foreign direct investment inflows to Bahrain in 2014 totaled USD 957 million, according to the World Investment Report 2015 issued by Mena Center for Investment and the Economic Development Council, in cooperation with the United Nations Conference on Trade and Development (UNCTAD). The report unveils that the rate of FDI flows to Bahrain as a percentage of gross fixed capital formation amounted to 22% in 2014, compared to 19.3% in 2013. The report shows that Bahrain’s shares of FDI flows in 2014 rose to 55.4% of GDP, compared to 54.3% in 2013. This reflects the economic attractiveness of Bahrain and is predictive of a robust future. Bahrain’s policies and vision will continue to successfully attract leading global companies in different fields, which demonstrate investors’ trust and confidence in the Bahraini economy and the investment environment. Thanks to these efforts, the volume of investments in Bahrain has increased by 158% between 2016 and 2017. In addition to the business friendly governmental policies there are cultural aspects of Bahrain that make it attractive to global commerce. This includes a largely English-speaking educated and skilled population, cultural openness, excellent communications links with Saudi Arabia and an easy access to other Gulf markets. This is in addition to the comparatively low operating costs. Not to ever be overlooked is the excellent quality of life. With its long history as a trading center, its tolerant culture, its wildlife and its ancient forts and mosques, Bahrain has strong global tourist appeal. It continues to increase its profile as a top global tourist destination. The sector possesses potentials and competitive advantages that qualify it to gain pride of place on the regional tourism map. It is also one of the renewable resources that contribute to the diversification of the economy, while providing great opportunities for, investment, employment and energizing of other economic sectors. Therefore, the tourist sector has been accorded high priority by H.RH. the Prime Minister. He considers tourism as one of the most important sectors to take advantage of Bahrain’s talents, openness and location. H.R.H. the Prime Minister saw the potential of this sector as far back as 1965 when as Minister of Finance he oversaw the establishment of Bahrain Hotels Company, which was founded in 1967 with a focus on constructing and managing hotels according to the highest international standards. In 1969, Bahrain joined the Inter-Arab Union of Hotels and Tourism and the Arab World Travel & Tourism Association – the most significant Arab tourism gathering. Other important measures include the preservation of the country’s monuments and encouraging excavations for new archeological discoveries. H.R.H. the Prime Minister has identified event and educational tourism as a unique opportunity to promote Bahrain’s culture. He sponsored the first exhibition for the Bahraini antiquities held at the Department of Education Library in March 1957 and inaugurated the first museum in Bahrain in March 1970. Tourism gained further attention by the establishment of the Bahrain Tourism and Exhibition Authority, which organizes many conventions and trade exhibitions in the Kingdom of Bahrain every year. Tourism gained has benefited from the establishment of the Supreme Council for Tourism in the early 1980s which is responsible for the planning coordination, development of tourism facilities. Since 1986, a well ordered regulatory regime has been in place to advance tourism. This includes a focus on organizational infrastructure in respect of hotels classification, mandatory .criteria and the regulation of travel and tour agents Jointly, all the above efforts have contributed in developing the tourism sector and strengthening the position of Bahrain as an important tourism attraction. Furthermore, investments have flourished in fields of building hotels, tourist resorts, restaurants, sports centers and many other projects all over the country. Tourism’s contribution to the GDP rose from 200 million in 2001 to BD 500 million in 2012. The sector represents 23,000 employees, which is around 5.5% of the total employment in Bahrain. The total number of tourists in Bahrain increased at the beginning of the second quarter of 2017 to 5.6 million tourists, with an annual rate of growth amounting to an increase of14% compared to the first half of 2016. The overall inbound international tourism expenditures totaled BD 631.4 million. In January 2016 the Bahraini capital, Manama, was named Capital of Gulf Tourism 2016, having held the title Capital of Arab Tourism in 2013 and nominated as Arab Capital of Culture 2012 as part of a UNESCO initiative. Such honors grow awareness of Bahrain’s cultural offerings, furthering the number of visitors who make the trip to explore the kingdom’s heritage. Comprehensive estimates put the direct impact of tourism to the national GDP at around 4% between 2011-14, rising to 5% in 2015. The indirect impact is thought to be much higher, at around 12% of GDP as of 2015, with the sector contributing roughly 40,000 jobs to the local economy. The World Travel & Tourism Council (WTTC) estimates that the direct contribution of travel and tourism to GDP was BD465.1m ($1.2bn) in 2015, 4.3% of overall GDP, with that figure expected to rise by 4.7% a year between 2016 and 2026 to hit BD771.8m ($2bn) by the end of that period. Direct and indirect revenue combined was estimated at BD1.1bn ($2.9bn) by the WTTC, roughly 10.6% of GDP in 2015, and forecast to grow by 4.8% annually until 2026. According to the World Economic Forum’s “Travel & Tourism Competitiveness Report 2015”, Bahrain ranked 60th out of 141 countries when it came to the competitiveness of its tourism sector, but fared better in several other categories, coming 52nd in human resources and 18th in price competitiveness. Additionally, within the MENA region, Bahrain was positioned third – behind only the UAE and Qatar. H.R.H. the Prime Minister’s development model is centered on the insight that the citizens of Bahrain are its most valuable resource, and its primary agents and the ultimate beneficiaries of development. Delivery of high quality services that provide decent living standards for all Bahrainis, enabling them to actively participate in the Kingdom’s development process; and, sustaining long term efforts to support the advancement of education, healthcare, housing, social welfare and labour market regulation. On the eve of independence in 1971 there were only 113 government schools, no university, 7 hospitals, 3 health centers with maternity beds, 8 health centers and four school clinics as compared to 6 Government hospitals, 18 Private hospitals, 28 health centers, 1 government maternity hospital, 207 government schools and 74 private schools at present. These successful policies have resulted in recognized progress. Since 1990, Bahrain has held a unique place and has been ranked first in the reports on Arab nations indicators of human development issued by the United Nations Development Program (UNDP). The number of private educational institutions through grade 12 rose from 162 in 2000 to over 220 today. Moreover, education in the Kingdom of Bahrain is both compulsory and without cost. Children enroll at either public or private schools when they reach school age. Free education is provided for all Bahraini and non-Bahraini students (males and females) studying at public schools for the three stages of education (primary, intermediate and secondary). Not only is tuition free but students receive textbooks at the beginning of each academic year without cost. There are special institutions to educate people with special needs, equipped with all the necessary amenities and facilities. The government currently spends approximately 13 per cent of its budget on education. This has resulted in a gross enrollment ratio in primary education of 98 per cent and a literacy rate of 94.6 per cent. Home to the first modern hospital in the region, founded by American missionaries in 1902, Bahrain has one of the oldest health care sectors in the Gulf. Over the course of the 20th century and the first decades of the twenty- first century, the country has developed a comprehensive high quality health care system, thanks to the vision and guidance of H.R.H. the Prime Minister, Bahrain, has become one of the best healthcare providers in the Gulf region. The government of Bahrain sees healthcare as paramount to the Bahrain’s evolution into a service-oriented economy, a place where high skilled practitioners and comprehensive facilities are the norm. Data by the World Health Organization (WHO) points to impressive strides in improving healthcare in Bahrain over the last three decades. This is largely due to a robust healthcare infrastructure, including four state- sponsored hospitals, fourteen private institutions and a large number of clinics and maternity hospitals. Bahrain offers free healthcare to all Bahraini nationals. H.R. H. the Prime Minister has served as President of the Education Board since 1957.
healthcare sector where 79.1% are Bahraini nationals. In June 2014, Bahrain’s National Health Information System won the United Nations Public Service Award for the region of West Asia for its Enhanced Public Knowledge Management System and its contribution to public healthcare. Healthcare is available through both private and public systems. Public medical services are free or subsidized. There is high demand for specialized medical services including up to date surgical procedures, such as transplants. Since 1978, His Highness has endorsed the WHO Alma Ata Declaration that called upon the member states to provide health for all by the year 2000. This goal has been achieved because H.R.H. the Prime Minister has long focused on the need to ensure efficient and effective healthcare for all. Due to his tireless efforts, all primary and secondary treatment within the public health system are free to Bahrainis and are also available to all residents and workers for a nominal fee. Bahrain’s public health service is based around a network of health centres, hospitals and specialized tertiary care centres. Bahrain has currently six government hospitals, one maternity hospital, 28 health centres, and 18 private hospitals and health units. In the same year, the country has about 2,704 physicians employed in the government sector and 1,385 employed in the private sector. Some 62% of outpatient visits to public facilities were made to health centres, and a further 18% to dedicated outpatient clinics, while outpatient services accounted for 80% of all visits to private hospitals in the country. The biggest health care facility in Bahrain is the Salmaniya Medical Complex, which dates back to the 1950s, but which was substantially expanded in 1978. It is a multi-specialty secondary and tertiary care facility, as well as the main centre for acute care, and hosts a number of specialized outpatient clinics. It has around 900 beds. Among the other main public hospitals in the country are the Bahrain Defence Forces Hospital (BDFH) and the King Hamad Teaching Hospital. Although it is a military facility, the BDFH is open to all and is the second-largest hospital in the country, with 400 beds. It treats inpatient, outpatient and emergency cases. The Defense Forces medical system, employs over 4000 staff and its services are available for free to Bahrainis and non-Bahrainis. King Hamad University Hospital was established in 2010 and is affiliated with the military medical system, but is open to all Bahrain residents. It enjoys a close relationship with the Royal College of Surgeons in Ireland’s facility in Bahrain to provide teaching for medical personnel in the country. Located in Muharraq, it has 311 beds and a total of 1952 staff. The health of the people of Bahrain is served with government and private hospitals, government health centers, government maternity hospitals as well as many specialist clinics. Secondary and tertiary care can be sourced from the Salmaniya Medical Complex, maternity hospitals and a psychiatric hospital. These services are of is the quality that would be the envy of nations twice the size of Bahrain and stems from the vision of His Royal Highness that a healthy nation is a productive nation. Bahrain’s accomplishments in health care have been recognized in reports published by the World Health Organization which concluded that “health status indicators in Bahrain as being comparable to those of developed countries”. The Kingdom of Bahrain is one of the leading countries in the region in providing housing for its citizens, starting long before international efforts to focus on housing, beginning with a policy commitment in 1961, the Government has succeeded in providing more than 130,000 housing units for citizens with limited income at a total cost estimated at BD 4 billion(around USD 10.6 billion) benefiting more than half of Bahrain’s citizens. This commitment to enhance the quality of life for all citizens began decades ago with the construction of Isa Town in the 1960s. It represents a model in how to implement an integrated strategic project in terms of construction, infrastructure, services and facilities. Today it provides approximately 13,919 fully serviced housing units and public utilities. H.R.H. the Prime Minister’s efforts in the housing sector date to 1962 when he issued a decree related to the establishment of a project of housing and ownership. This marked the beginning of the government’s march to provide adequate housing for all citizens. The then Secretary General Ban Ki-moon stated that for over the last quarter of a century H.R. H. the Prime Minister had helped to lift the Kingdom of Bahrain from what was largely a collection of rural villages into a thriving and diversified economy and that it was inspiring to see that this has been done while providing social welfare support and focusing on educational opportunities and jobs for all. H.R.H. the Prime Minister has forcefully and consistently emphasized the strong link between development, peace and security and the need to establish peace, tolerance and coexistence between nations and peoples. In this context, he has worked focused on making Bahrain an oasis of peace, security, tolerance and moderation in the Arab and Islamic world. Promoting these principles internationally, H.R.H. Prince Khalifa bin Salman Al Khalifa is committed to putting into practice the promotion of peaceful co-existence among all religious and ethnic minorities living in Bahrain, encouraging intellectuals and artists to build bridges between people, disseminating a culture of peace and enhancing co-existence. Bahrain is poised to play an ever increasingly important role in H.R.H. the Prime Minister continues to stress the importance of ideals in his annual messages on the occasions of the United Nations Day and the International Day of Peace which embody the shared aspiration to end the needless suffering caused by armed conflict. Thanks to this vision of tolerance and unity in diversity, Bahrain has become a model of co-existence, where different religions and cultures live peacefully side by side. The proximity of a mosque near Husseiniya (a religious congregation hall for Shia) and a Church near a Synagogue or a Hindu Temple exemplify the spirit of diversity recognized as a high value in Bahrain. In recognition of the above-mentioned achievements and in honour of his leadership in taking Bahrain from its simple beginnings to a modern, technologically-advanced nation with a vibrant economy and an enduring sustainable future, H.R.H. the Prime Minister has received several prestigious international and regional awards. The 2006 Special Citation of the Habitat Scroll of Honour from UN- Habitat was awarded in recognition of his visionary leadership in reducing poverty and social exclusion by facilitating the provision of housing to the poor and disadvantaged, building urban and infrastructure development while preserving Bahrain’s cultural heritage. The U.N. Millennium Development Goals (MDGs) Award was given in 2010 for his pioneering role in furthering the global efforts towards achieving the MDGs. The UNESCO Avicenna Award was given to him 2009 for his strenuous efforts in boosting heritage and culture, UNESCO activities and the development of education in Bahrain which was followed with the UNESCO Peace Medal in 2017 for his role in promoting peace and spreading the values of love and fraternity. He received the African Union Shield in 2012 for his role in promoting regional and global peace and security and the Global Visionary Leadership Award of the Union of Arab Banks on November 19, 2009, in recognition of his work in developing the financial and banking sectors of Bahrain which has turned it into the financial and banking services center of the region. He received the Statesman Award, Asian Business Leadership Forum, December 2013 in appreciation of his great role in pushing forward Bahrain’s developmental plans, consolidating cooperation in international relations, facilitating the establishment of joint investments and supporting the diverse relations between Bahrain and Asian countries. He was given the Golden Award of the International Federation of Business Professional Women (BPW International) on May 23, 2014, in appreciation his role as a leader of change and an advocate of women’s empowerment. This is the first time that the award has been bestowed on a “leader of change” since the inception of the influential network. He received the Development Work Shield, Arab League on April 19, 2017. This shield was granted to His Loyal Highness during a big celebration at Arab League Headquarter, Cairo in appreciation of his strenuous efforts at the level of sustainable development that covered all Bahraini regions. Bahrain has achieved many successes and will continue to do so. This trajectory has been achieved largely as a result of the leadership of H.R.H. the Prime Minister Prince Khalifa bin Salman Al Khalifa. He has been a committed energetic leader of his nation and its people and established a social and economic infrastructure that will ensure a sustainable future… and this is why Iran is attacking Bahrain’s PM.